He was intrigued enough by my analysis to ask me on his show, but I knew he was a bit skeptical as well. And that’s perfectly normal – even experienced investors and money managers like Moe think of dividend payers in terms of their current yields only. Price appreciation potential often gets ignored, and the thought of achieving 100%+ profits from a safe dividend payer sounds absurd. But smart investors bank their payouts while their stocks double in price. Subscribers to my Hidden Yields service know the three-step formula that I explained to Moe well. In fact, our “dividend doubling” portfolio has earned 23.3% yearly gains since inception three years ago – which means we’re closing in on 100% profits already. On the show we discussed Verizon (VZ), which has piqued the interest of many income investors lately. The stock yields 4.6%, and the dividend is covered by monthly cell phone bills across America. Here’s the problem buying Verizon in hopes of a double – it’s not going to happen. Its 4.6% yield would get us repaid in 15 years. That’s not fast enough for our purposes, so we would need to look to dividend growth to fill the gap and speed up the pace of our profits. 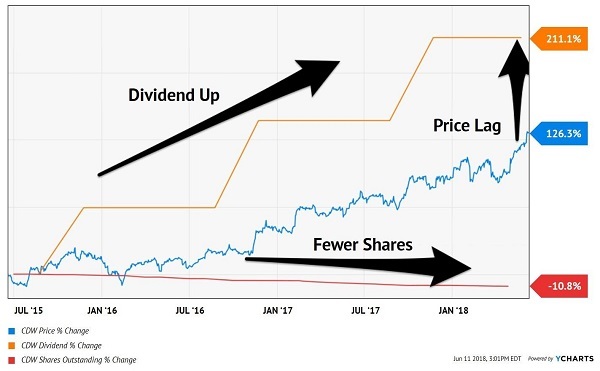 For double-digit price appreciation, we must buy dividends destined to grow by 10% or more annually in the years ahead. This means we need to find businesses that are booming (with higher profits driving higher payouts). To do so, it helps to focus on stocks that are threat-proof. The classic “Dogs of the Dow” strategy advises buying the then highest-yielding Dow Jones Industrial Average stocks, then holding onto them for a year. The idea is that higher yields are a signal of a beaten-up share price in which the business struggles are temporary. When business picks up again, so will the undervalued stock. The problem using this strategy blindly today is that many businesses are becoming obsolete before our very eyes. Look no further than Jeff Bezos and his firm Amazon, which crushes entire sectors for sport additional growth. To qualify for our Hidden Yields portfolio, a business model must be Amazon-proof, rate-proof and heck, even tariff-proof. Incidentally, this doesn’t mean we must avoid all brick and mortar stores. Best Buy (BBY), for example, decided to take Amazon head-on in 2012 when turnaround CEO Hubert Joly took the helm. And not only did the electronics giant live to tell about it, but it’s now leveraging Jeff Bezos’ website as a shopping channel of its own! Expert Service. Unbeatable Stock Price. What else doesn’t Amazon have? A dividend, of course. Meanwhile Best Buy pays one, and its growth has been spectacular. Joly & Co. just raised their dividend by 32%. This “high velocity payout” is now up 165% in the last five years! Its stock has followed its dividend higher, delivering 187% total returns (including those payouts). But are BBY shares truly a best buy today? It depends if the price is still lagging its payout. Dividends are magnets that pull their share prices along with them. If you’re looking for the stock market’s tail that wags the dog, pay attention to the payouts attached to a given share price. Steps one and two help us lock in double-digit yearly gains. But if we’re looking for quick triple-digit (100%+) upside, we should only buy stocks that are lagging their payouts. 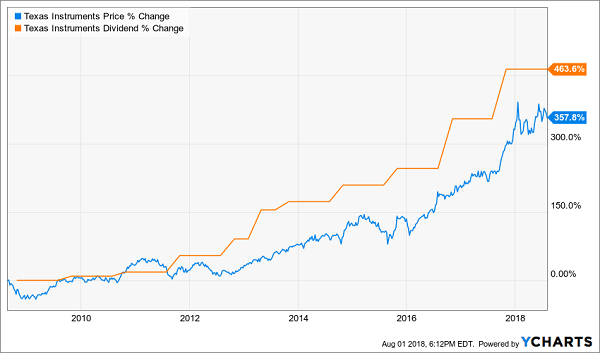 Texas Instruments (TXN) is a great example of a stock we’ve profited from in Hidden Yields (+46% returns in the 14 months we’ve owned it). The stock market can do its own thing over any set of days, weeks or month. But over many years, dividends are the tail that wags the (price) dog. As payouts go, so will their corresponding stock price. This is where share repurchases become a compelling natural steroid for our portfolio. When management teams repurchase their own stock smartly (when it’s cheap), they reduce the number of outstanding shares. Which means any dividend raises get an added boost on a per share basis. This stock boasts an ideal setup for us. 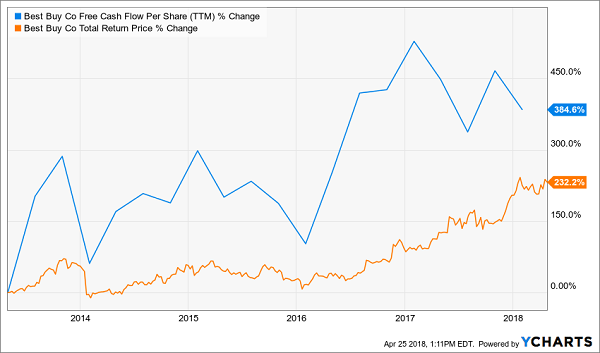 Shares are too cheap, the business owns a profitable niche with business momentum, and the broader investing herd isn’t paying attention because they don’t understand how the company truly makes money. If you like this setup, you’ll LOVE nine more that I’ve identified. All of these stocks pay dividends today. And they’re all likely to double your money in the months ahead. How much money should you allocate to pursuing dividend stocks that will double your money? As you can see – as much as possible. This strategy is such a “slam dunk” for investing returns that there’s no reason to collect more current yields than you need right now. There are three big benefits to buying dividend payers that are likely to double your money. Benefit 1. You invest a set amount of money into one of these “hidden yield” stocks and immediately start getting regular returns on the order of 3%, 4%, or maybe more. Benefit 2. Over time, your dividend payments go up so you’re eventually earning 8%, 9%, or 10% a year on your original investment. Benefit 3. As your income is rising, other investors are also bidding up the price of your shares to keep pace with the increasing yields. 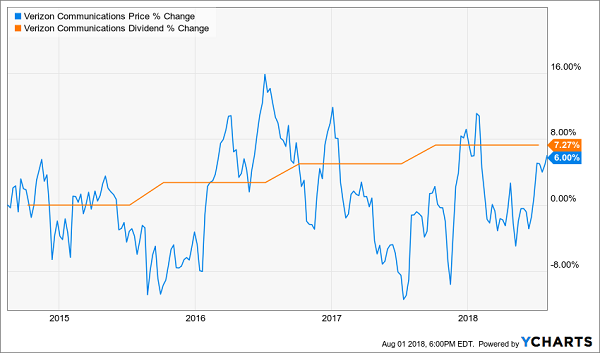 Which future “dividend doubles” should you buy today? Well you know me – I’ve got seven best buys in this special that should safely double your money in the months ahead. Plus, I have another top ten list that I’ll deliver to your email inbox this Friday as a thank you for signing up! If you achieve returns of 23.3%, you’ll double your money in less than three years. So if you haven’t been following this strategy, why not? The best time to get started is right now – before the dividend payers I mentioned begin to move. Click here and I’ll share their names, tickers and buy prices with you right now.